We decided after our strenuous ski mountaineering weekend it was definitely time for a weekend spent lazing at home..........until Ally phoned and lured us in with tempting images of huts, skis, whiskey and mountains. 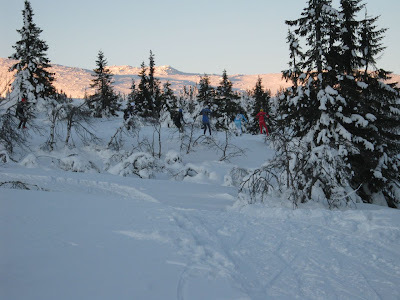 So this time we were off on a fjellski tur (kind of fat cross country skis with steel edges) from Prestøyhytte (which we waded into a few months ago in an earlier post) and on to Shutzhytte in the Selbu area. We all packed wildly and furiously on Friday afternoon and managed to get away by the crack of about 5 o'clock. We had a stop off at the huge Coop Supermarket on the other side of town and lost each other in the vegie section for some time - big supermarkets are so uncommon here you forget how overwhelming they can be! A couple of weeks ago we had a huge hoar frost in Trondheim, so I included a few photos of the ice laden trees. Looking out our front window, brrrrrrrrrrrrr. It was about -20 and very damp! While the weather in Trondheim continues to be miserable and rainy, we have managed to escape for the last two weekends in a row into the mountains. The ski tracks round Bymarke (where we live) are up to no good and the streets are slippery and wet, so getting away is the best thing to do right now. Our first trip was a Norsk Skialpinisme Sammling (Norwegian Ski Mountaineering Group Training). We know a couple of the guys in this group through the Wing Orienteering Club and they kindly allowed us to tag along and borrow some fancy ski gear for the weekend. One week after our return from Sjusjoen we were ready to put the cross country skis on again for the National Ski Orienteering competitions down in Trysil. We had to leave Trondheim straight after work on Friday because it is a 5 hour drive south. Trondheim had been experiencing an extreme freeze all week with temperatures hovering around -20. This was making biking to work an interesting experience! As we drove South we passed through Røros, a small town which is located in a kind of depression, meaning it frequently records extremely cold temperatures. When we passed through we hopped out of the car and had our first experience of - 34! Trysil is a ski resort quite high on a mountain side, and interestingly the temperature actually steadily increased as we climbed up - at the ski resort the temperature was a balmy -14. We were staying with the rest of the Wing contingent, and had two very nice apartments to stay in, located right beside the start area. Chris and I had a couple of very busy weeks before the Christmas holidays finally arrived. Chris has been commuting everywhere by running, because of his arm. We were longing for the snow to arrive, but instead it was just freezing cold, dark and icy. But finally, just a few days before Christmas the snow came. We immediately took to the skis, but unfortunately the rocks were still poking out and I saw sparks fly off Chris's ski's a few times! We had a lovely Christmas Eve meal with a colleague and her family, then had a quiet day with some skyping, some ski unwrapping, and a pretty walk up the Gråkallen Domes in the snow. We had hired a car and spent boxing day morning filling it with stuff for our trip down south for some ski action with Fiona and Stu (Kiwi friend's living in Bristol at the moment). Stu was recovering from just having raced in Abu Dhabi and the World Adventure Race Champs (along with Fiona and Chris) in Portugal.